This Deluxe Kitty Sill with Bolster is made by K&H Pet Products. It is tan and measures 14" x 24" x 3". 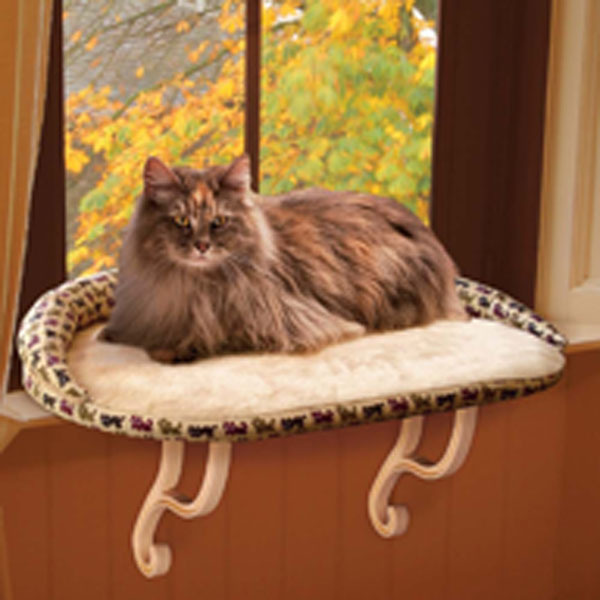 K&H took the popular Kitty Sill to the next level and created both hooded and bolstered kitty sills. "The bolster is covered with an attractive, poly/cotton kitty print. The inside is lined with soft velvety microfleece. The bolster zips off and can convert into a plush kitty sill. The hood offers security and your kitty can still see all the views to the outdoors. If your kitty wants to cuddle, they can have all the advantages of looking out the window and feeling the sunshine while having the security of a bolster. Dimensions: 14"" x 24"" x 3""